The Saint Valentine’s Day massacre is the name given to the 1929 murder of 7 mob associates as part of a prohibition era conflict between two powerful criminal gangs in Chicago which was the South side Italian gang led by Al Capone and the North Side Irish gang led by Bugs Moran. 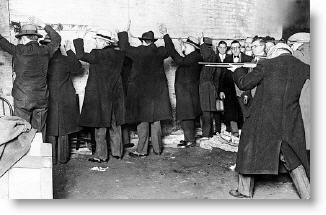 Egan’s Rats gangs were also suspected to have played a large role in the St. Valentine’s Day Massacre, assisting Al Capone. On the morning of Thursday, February 14, 1929, St. Valentine’s Day, five members of the North Side gang, plus gang collaborators Reinhardt. H. Schwimmer and John May, were lined up against a wall inside of the garage 2122 North Clark Street, in Lincoln Park neighborhood of Chicago’s north side, and executed. Two of the shooters were dressed as police men, while the others wore suits and ties with overcoats and hats. John Mays shepherd was leased to a truck and began howling which got the attention for help for his owner. Frank Gusenberg was still alive once the killers left and he was rushed to the hospital with 14 bullet wounds and when they tried asking him who shot him he wouldn’t tell because of the gangland etiquette. These shootings were all planed by the American gangster Al Capone. February 14, 1929 at 10:30 am marked the beginning of the end to Capone’s influence in Chicago. The Massacre brought the belated attention of the federal government to bear on Capone and his criminal activities. Student Sites. Web. 08 Feb. 2012. <http://mrgallagherstudentsites.com>. Wikipedia, the Free Encyclopedia. Web. 08 Feb. 2012. <http://en.wikipedia.org>. "Saint Valentine's Day Massacre." Wikipedia, the Free Encyclopedia. Web. 08 Feb. 2012. <http://en.wikipedia.org/wiki/Saint_Valentine's_Day_massacre>.